I dig trees celebrate 500,000 trees planted - can we do more? The Conservation Volunteers are delighted to announce since 2015 the I Dig Tree programme has successfully planted a whopping half a million trees. This is such great news especially at the beginning of National Tree Planting week. I Dig Trees is designed to make a real difference where you live. Reducing CO2, improving green spaces and encouraging wildlife to set up home. Every year, we join thousands of volunteers and community groups, to get our hands dirty and breathe fresh, new life into your cities, parks and schools. "Growing Spaces would like to express our utmost thanks to Arjuna Wholefoods, who have made a generous donation of £350 to our project! Arjuna donate 10% of their annual profits to local charities and community groups, and we are delighted to have been selected as a recipient this year. Cambridge's Growing Spaces team put in many hours of planning and planting throughout the year to ensure that the spaces are always available for use by all Cambridge residents. Like Arjuna, Growing Spaces wouldn't be possible without the tireless efforts and cooperation of its members. In order to acknowledge this and help raise public awareness and understanding of what we do, we plan on using Arjuna's donation to release a short film about the group. We're confident that this will help draw attention to the abundance of free-to-access food lining our city's hedgerows, parks and streets. The annual report for 2016/2017 (pdf 1.5Mb) is out. Check out what we did - we've been busy. The report includes some results from the membership survey and the Treasurer's report, in case you missed the AGM. Would you like to grow your own fruit, veg, herbs and flowers? Taking on an allotment plot can be a satisfying and fun learning experience, and it needn't be expensive. 1st October is the date when traditionally allotment leases are renewed, so it's a good time to start. Your local allotment site may have some vacant plots, so take a look at the map to find out which allotment site is local to you. Also, if you want to learn a bit more about growing, check out Dave's Grow-Your-Own sessions on Saturdays, held at his plot in Trumpington. More info here. Ripe plums for free, need to be picked! We are located in Somersham, Cambridgeshire. You should now be able to access the site using https. Join the World War II Rationing Challenge! World War II Rationing Challenge: learn from the past for a better future. Take part in Cambridge Sustainable Food's World War II Rationing Challenge for one, two, three or four weeks, from Tuesday 20th June to Tuesday 18th July. Many of the foods that were rationed during the war are foods that are contributing to climate change today. Be healthy and environmentally sustainable! Sign up online and let us know how you get on! Bi-weekly emails with recipes, tips and interesting facts. More information on our website. Have you ever wondered why repair cafes are a good idea? Find our by watching this short film Channel 4 made at the Fulbourn Repair Cafe. It explains why fixing stuff is good for the planet and good for us too. Plus learning how to fix things is interesting and empowering. Cambridge Sustainable Food are Recruiting! Peter Bates of Informetis would like to invite you to take part in the Informetis UK Home Appliance Trial. He is managing this trial for Informetis - who are based in Cambridge. The trial will lead to creating an "itemised view" of the electricity bill that shows how much electricity each of the main electrical appliances uses in the home (e.g. Fridge, Washing Machine and Microwave). This will lead onto creating cost effective technology solutions that help home consumers reduce their electricity bills and thus globally contribute to reducing carbon emissions. Student Hubs is recruiting for a Programme Manager based in our Cambridge office. The successful candidate will be diligent and highly organised, with at least one year of experience following graduation. Our Programme Manager will be responsible for leading three of Cambridge Hub's flagship programmes, and supporting our student-led vision for other aspects of our work. We are accepting applications on a rolling basis, and will close them once we find the perfect candidate. See our application page for more details. Time for hustings again! It's a good opportunity to see the candidates for the general election, hear what they have to say, and ask questions. If you'd like to go along, you usually need to book a ticket (and it's usually free). Here's a list of hustings organised by different groups in Cambridge. If you're in the South Cambs or South-East Cambs constituency, some hustings events are listed here. Cropshare's partner farm, Waterland Organics is looking for more members for its CSA scheme. By joining you get a range of delicious local and organic veg delivered for free over a 17 or 34 week period, and help to safeguard farming in our community for years to come. Deadline for joining this years scheme is June 1st. To find out more, visit Waterland Organics CSA page. Meeting venue - can you help? The national Transition Town network have a plan to revive the Transition East Anglia network to help and support individual Transition Town groups across our region. A workshop is planned for Sunday 7th May 10am - 4pm and we hope to hold the event in Cambridge. We're actively seeking a suitable low or no cost venue, could you offer a space in your home/office for this? It would be for between 8 and 20 people. If you think you can help, please contact Jacky. Thanks for reading! New home-owner needed - is this you? Now in its fourth year, One Year in Transition (1YT) is a challenging, contemporary, hope-filled programme for people (over 20) who want to make change happen. Over four week-long meet-ups and eleven months of support in between you will evolve your future income-generating livelihood. One Year in Transition (1YT) is now in its fourth year and gets better all the time with input from students. The programme is designed to equip young adults with the tools needed to create (and flourish in) a low-carbon future that sustains ourselves, our communities and life on Earth. The programme is low cost, flexible and fun. The next course runs from September 2017 - July 2018. There are spaces for up to 16 participants with an interview process via Skype. If you were to think about your everyday actions would you consider them to be sustainable? What would motivate you into more sustainable activities? I am currently undertaking a PhD looking into sustainability and the role that local groups and its members like Transition Cambridge play in regenerating our neighbourhoods and cities from a bottom up approach. I am looking for volunteers who would not mind undertaking a short interview, to assist me in understanding what motivates Transition Cambridge members in undertaking sustainable actions. What would influence / improve your everyday actions and activities, facilitating sustainability? How does Transition Cambridge facilitate learning through communities of practice? Cambridge Sustainable Food needs YOU! With Spring having started, we have lots of great volunteering opportunities coming up in the next few months and we'd love you to get involved. We will have the opportunity to challenge the candidates at a number of hustings prior to the election starting with the one at ARU on 31st March organised by Cambridge Carbon Footprint and Anglia Ruskin University. Do you have suggestions for questions we should ask? Please let us know if you do. Important topics could include transport, land use, biodiversity, skills - what do you think? 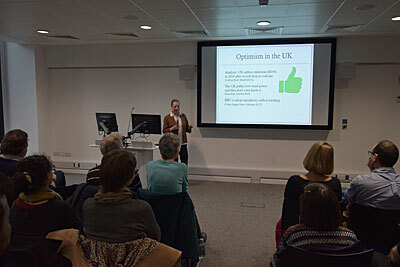 Nicola Terry gave a short talk as part of the Optimistic Show and Tell event at the Science Festival. Her talk was based on the blog post here and it was about the fact that even though the media tends to bury it there really are good news stories around about climate change, and people doing good things - with examples from Cambridge. The other talks at the event were enormously diverse and covered a wide range of topics including the various sort of beans are being growing locally for humans to eat (not just cattle food), the power of crowd source science in conservation programs and the extraordinary number of species you can find even in an urban garden. There are lots of reasons to be optimistic! Transition Survey - You did it! A huge thank you to everyone who filled in our Community Members' Online Survey over the last 3 weeks, we had over 100 responses and have discovered some illuminating information about why you are attracted to Transition Cambridge and what activities and interests you'd most like to engage with. Our Student SIP Team put in a phenomenal amount of work and have produced a very useful and worthwhile report, as well as some great suggestions for helping us to build on the successes and achievements of the last few years. Stay tuned for more on this in the coming months! We also have a lucky £20 winner, who has been contacted, and hope to formally announce this in due course. Thanks again, and hope to see you at one of our gatherings soon! As part of the new Clay Farm Centre development, Cambridge City Council is inviting tenders for a Cafe Concession. This will be in a new community centre with a library and a medical centre. The cafe has a fitted kitchen and servery with seating for approximately 31 in the seating area. There is also a patio area outside. There is a planning restriction forbidding cooking except for reheating or warming food (e.g. in a microwave). Cambridge City Council has now completed a draft Community Centres Strategy, which proposes "a positive and ambitious vision for improved Council-owned community centres, based on evidence of need, across the city." Local residents and stakeholders (including Transition groups who use community centres for meetings and activities) have been invited to comment on draft proposals for the 8 community centres owned or managed by the City Council. Here is a link to the consultation, which runs until midday on 5 May 2017. Postal and phone responses are also possible, see the contact section in the link for details. Can You Spare a Few Minutes for our Membership Survey? We want to run enjoyable and effective meetings and activities, which is why we're running this survey to find out what our community wants from Transition. We'd really love to have your help, particularly if you've been reading the bulletin for a while but haven't made it to any events or activities - or if you've only come to one or two. The survey will be short and your answers anonymous and confidential. It should take just a few minutes to complete and you might even win £20 if you leave your email address at the end! Your opinion and experience matters - please join in! Please spare a few minutes to fill in this survey about you and what you think of our activities. It doesn't take long! This survey has been devised by a team of 5 Cambridge University students as part of a project to help us broaden our reach and engage more people. So whether you are a seasoned member, or have been to a few events, or just get our newsletter but haven't actually met us yet, we would like to understand more about you and what you think we should be doing. You will also have a chance to win £20 in a prize draw on 17th March - open to everyone who is signed up to our newsletter and completes a survey. Are you keen to fix your own bike but short on space or need a few specialist tools? Perhaps you'd just like some advice while you build up your own bike? Bin days are changing - are YOU ready? Sweeping changes to bin collections across Cambridge will take effect from Monday 27 February. You may have a change to your collection day or time, or to the sequence in which your black or blue and green bins are put out. Romsey Community Garden is a small haven in the midst of Romsey Town. In the summer it's full of flowers and vegetables, grown with the help of local residents and their children. In the winter it's a bit quieter, but there's still a bench looking out over the garden where people can come to rest and watch the world go by. The coordinator, Sarah, has just moved further out of town, and so it's time to find a new coordinator to help shape the garden over the next year or two. So far, we've focused on fruit trees and bushes, vegetables, and flowers, while maintaining a grassy area in the middle for picnics and bonfires. Where possible, we've tried to follow permaculture principles. And there is a dedicated team of locals who do their best to keep everything looking nice. If you might be interested in taking this on, please contact Sarah for a chat. Coordination is not a big job, it involves agreeing dates for garden days and coming up with a list of tasks that needs undertaking. Sometimes it involves picking up materials, such as seeds, from the garden centre. The garden days are always fun! You can read a bit more about the garden here. Repair Cafes spreading across Cambridgeshire! Tune in tomorrow (Thursday) to BBC Radio Cambridgeshire to hear Chris Moller (Cottenham and Cambs Repair Cafés) and Nicole Barton (CCF) talking Repair Cafes with Jeremy Sallis 12.15-12.45pm. There are several more Repair Cafes coming up in the Cambridge area (including Shelford, Histon and Sawston), and these are all listed on the Circular Cambridge web-site here. Plus tonight (25 Jan) there's a social event for repairers, to share skills and find out more about how to join the cafes as a repairer (more info here). The evening will have focus on the more technical and electronic/electrical aspects of repairs rather than sewing, bike and cycle repairs. After eight and a half years of sending this bulletin out weekly, we agreed on Monday at the Hub meeting to turn it into a fortnightly newsletter with immediate effect. We hope this will give some much needed breathing space to our team and also create an incentive for new editors to join us in due course. Our next bulletin will appear the week beginning 6th February. If you have items and news to share please submit as usual with a bit more advance notice! However, moderators and editors will still check bulletin submissions, which will appear on the Transition Cambridge news and events webpages once approved for publication. (See the News and Events tab on the home page) So please do check in there for all the latest news updates between Bulletin mailings. If resources and energy permit, the Bulletin could return to weekly later this year. Please contact Anna. if you'd like to join the team. James has made a beautiful video of the Pivotal Festival of Environment, Community and Technology last November. Watch it and reminisce or wish you had been there! We need gardeners to adopt some of our growing spaces! If you think you will have time to adopt one growing space this year, please have a look at our map. Perhaps there is one close to you, just waiting for you! Growing Spaces aims to reclaim unloved and underused public spaces around the city of Cambridge and transform them using edible landscaping. Thanks to Lush for Best Charity Pot ever. On the weekend before Christmas Lush, the handmade cosmetics company, invited Transition Cambridge to come into the stall and raise money through their charity pot scheme. It was a huge success raising £446, a record amount for the Cambridge stall. We wish to say a big thank you to Lush (especially Rose Williamson who personally invited us and gave excellent advice) and to all to all the people who bought charity pots for us. We hope you took away our leaflet and come back to the website to see if there are other ways you would like to get involved. Some of the money raised will probably go to CropShare for their lay down weeder project and the rest will go into our general fund for core spending, awareness raising, venue hire for events and other equipment. See here for Jacky's blog post last year on how we raise funds and spend them. There are some great photos in the Cambridge News writeup of the Repair Cafe in Girton. There are lots more planned for 2017 - if you have something that needs fixing don't throw it away! Maybe one of our experts could help make it useful again.